Both Thermoplastic covers are identical having a central cut-out exposing the underlying purple velvet. 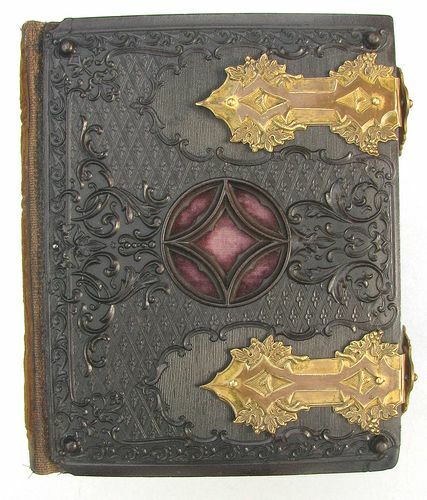 The brown velvet spine is embossed with a floral design and the word "ALBUM". The gold lithographed inside front cover page reads: "Photograph Album". It is marked M. Bradley. That would be The Bradley Litho Co. of Springfield, Massachusetts. Milton Bradley is credited with having launched the board game industry. All CDV openings are surrounded by 3 gilded outlines which was typical of American albums of the Civil War era. The album's 20 pages can accomodate 40 CDVs. Gild decorated blank index. Fancy gilded brass clasps. Page maker is Bradley Litho Co. of Springfield, Massachusetts.